inscription: Per S.B. - Verso: "Pond Farm" and jug (mark). In pencil: "$80.00." Per S.B. - Footed vase with wide mouth and two handles. Its flaring rim has a beveled lip. Handle are attached low on the shoulders. Body and foot are glazed with black, orange, brown, and white in spaces created by incised, curvilinear lines. 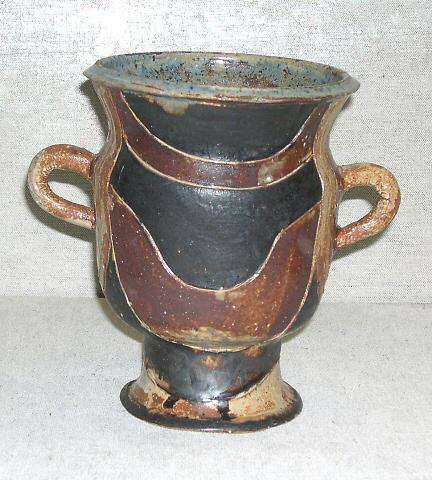 White specks that appear in the glazes may be imperfections in the clay. Interior and lips are glazed in blue.